This is elbow-your-Great-Aunt-Dora-out-of-the-way-to-get-the-last-slice delicious! Chocolate should most certainly be represented at the Thanksgiving table, and pecans are the ideal plus-one to get it into the party. 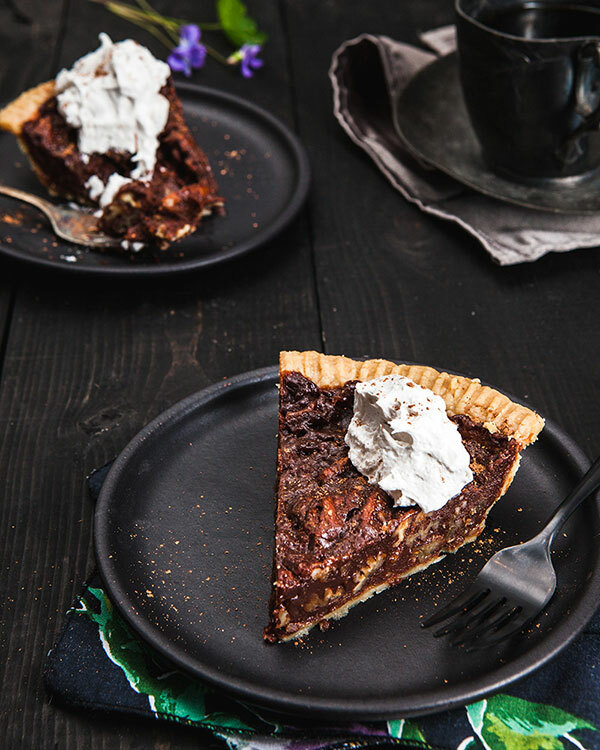 This pie is really rich and caramelly, with all that toasty pecan nuttiness studded throughout. Don’t worry, once you share a bite of your slice with Great Aunt Dora, she will totally understand all that elbowing. There are some tips on making your storebought crust look homemade right here! In a 2-quart saucepan, mix the sugars and agave. Heat over medium heat, stirring often with a whisk. Once small bubbles start rapidly forming, stir constantly for about 10 minutes. The mixture should become thick and syrupy, but it shouldn’t be boiling too fiercely. If it starts climbing the walls of the pan in big bubbles, lower the heat a bit. This looks wonderful! While Canadian Thanksgiving has come and gone, I think I can come up with a valid reason to whip this up! Question: If I double this recipe, do you think I can freeze one for a future chocolate pecan pie emergency? I would love to know how this freezes once you’ve tried it out! I have a feeling it might not freeze too well because of the creamy consistency, but who knows. Here’s my question: Is brown rice syrup an acceptable substitute for agave in this recipe? Trying to keep a hold of the size of my shopping list this week but I don’t want to sacrifice the quality of my pie if agave is important! I swapped out the agave for some maple syrup since that’s what I had on hand and it turned out fine. I think it just needs to be a liquid sugar so the other 2 sugars get a head start on dissolving. Thank you, that’s helpful! So excited to try this for Thanksgiving. Well, I planned on making your Maple Pecsn pie. What to do? What to do? I made this the night I got the book and took it to a work potluck the next day. No one knew it was vegan, and no one knew there was tofu in it! I had a problem where the chocolate sort of seized up on me when I added it to the caramel, but I tossed the mixture in the Vitamix and it came back out smooth as can be. The filling is awesome – I hate traditional pecan pie (why did I make this?!) but this pie is like the soft, underbaked center of brownies with a bunch of pecans thrown in – read: delicious. I’m using the rest of the leftover silken tofu to make another pie for my omni family’s Thanksgiving! I love the new book! Katie. I had the same issue with it seizing up. I ended up putting the tofu mixture in with it back in the saucepan and stirring and heating until it finally got mostly smooth. I should have put it all in the blender. I tried using my immersion blender…don’t do that. It is in the oven now and have my fingers crossed. Sounds like it should be fine. Man, licking the bowls clean was a pleasure. So yummy. Agnes, how did yours turn out? I had the same issue but I don’t have a blender (only an immersion), so I did the same and put it all in the pot to melt down. it’s in the oven now. the suspense is killing me! I’m having the same issue with the sugars seizing up. It tossed three pan full and don’t know if i should go for round 4 or just give up on having pie for tomorrow. I’ve tried lowering the heat to where it barely bubbles and reducing the cook time on it. The last round I actually added the chocolate and oil anyway and the mixture was like a super thick brownie mix. Any tips?? After the chocolate seized up, mine looked like brownie batter in a pool of oil. Not good. I added the tofu mixture to it in a bowl but it solidifies the chocolate, making things worse. So, I put it back on the stove to melt it alllllll down. Once it was completely smooth, I stirred in the pecans and poured it into my pie shell. Baked 40 min as instructed, and it looks perfect. If I could share a photo in this comment I would. Thank you for sharing your similar struggle! I hope *fingers crossed* the end result after cooling works out. Before I let the sugars seize up again I added the oil and chocolate and it became super thick again, but at that point I had ran out of ingredients so I threw in the tofu mix into the pan anyway and it miraculously turned super smooth ( and exceedingly delicious)! Just pulled it out of the oven and I think it’s going to be fine. I substituted maple syrup for agave, and instead of turning to syrup, it turned into a pot of sugar! So I threw a little bit of water in to melt it back down. Then left the whole thing on med-low while I added the oil and chips. It firmed up a bit, but didn’t totally seize, maybe because it was still on the heat? Anyway. It just finished cooking and looks beautiful, and the taste I sneaked before was fab! I had the same issue with the chocolate seizing up. It was a giant glob of hard chocolate in bit of an oil bath. We put the mixture in our Vitamix and it turned out perfect! Put it back in a bowl then added the tofu mix and it was super smooth. Thank you Vitamix! And the pie was delicious!!! I also had the seizing problem! When I added the chocolate and oil the chocolate melted quickly but there was also a liquid that wouldn’t incorporate. I pulled it off the stove and added the tofu mixture but the chocolate/sugar combo started clumping into hard balls. After a short panic, I poured everything back in the saucepan, stuck it on low, melted the chocolate balls, added the pecans, and poured that into the pie crust. Baked it and hoped for the best… And it came out great!! Sooo rich and delicious. Kat. Mine turned out great! Thankfully. Have to figure the seizing thing out, because it was a hassle. Mine seized as well when I added the chocolate chips, although I did not get the pools of oil that others have mentioned. I turned off the heat, added the tofu mixture, and hand-whisked the hell out of it until I had a smooth, liquid mixture. Added the pecans, tossed it in the oven, and a delicious, perfect pie came out! I should note that I subbed maple syrup in for the agave, in case that matters. I didn’t have the pools of oil either. Just relatively firm globs of chocolate. The pie was delicious and was exactly the right texture and firmness when it was done. I’m going to try it again at some point and maybe just heat the sugars for a while until they get hot enough to melt the chocolate and coconut oil, throw in the pecans, put in the pan and hope that the baking thickens it? I wonder if that would work. This looks wonderful! While Canadian Thanksgiving has come and gone, I think I can come up with a valid reason to whip this up! I tried it with a cup of carob chips instead of chocolate and it turned out perfectly! I blended it all with the tofu after it had lightly boiled then added the pecan halves. Perfect! Also did it with a GF crust. Perfect for Thanksgiving. Thanks! This pie was so simple and delicious! I took it as my Thanksgiving dessert to my (omnivore) family’s gathering and everybody loved it. I managed to bring a couple pieces home, but my frozen pie crust was a two-pack, so I’m thinking of just making it again for my household to enjoy. Seriously excellent pie, pretty rich but not to the point of being unable to enjoy a whole slice! As far as texture issues, I didn’t have any trouble with the chocolate mixture. I did use brown rice syrup and a little bit of water since the syrup was thicker than agave. I used my usual unrefined coconut oil and it mixed just fine. When I went to mix everything together later I did have a few crystallized pieces, but they were easy to crush back into the mix just with the back of a spoon. I didn’t plan ahead well either so I thought I might be leaving it to cool too long, but everything worked perfectly! guess i was early on being excited. i only see the brownie recipe and no others. One more voice, one more solution to the chocolate problem: My chocolate also clumped up with the sugar, so I threw it in my food processor as recommended here. Unfortunately that only turned it to sandy chocolatey sugar, so I threw the sand back in the pan, added the tofu mixture which I had made beforehand, and was able to successfully melt it all down. The batter was delicious and the pie smells and looks perfect–tomorrow will be the taste test but I’m confident it will pass. Are we supposed to toast the pecan before using them? It is is kind of article that i always want to read. 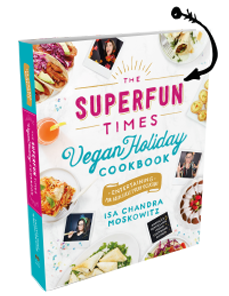 It’s an awesome recipe for all, not only vegans. Share it with your friends please! This one’s even better than your original recipe!! Isa you are amazing! This pie is absolutely fabulous. I had no issues making it and I certainly have no issues eating it. This sounds really good! I don’t eat it nearly enough. Now I want to try it this way! Just with how simple I could have had a great cake to eat. Thank you for sharing the way. I will do it at home, Thank you very much for sharing. Hope you will update more news in the future. Do I use extra firm tofu (the same that you would use for tofu scramble) or silken tofu the kind that is so soft that resembles jello? Good recipe i already did that very tasty.Good job thank you.. Wish I had come here to read these comments before wasting my time and expensive ingredients. I usually make the maple pecan pie, which I really love and find easy. Thought I switch it up to this recipe. First chocolate caramel seized when adding the chocolate. Threw it out. Second batch seized when adding tofu mixture. Threw that out, now have one bowl and one pan full of HARD chocolate candy soaking so I can scrub them. Oh yes and no dessert! This recipe ought to give temperatures to read with a candy thermometer since it seems to be such a delicate and temperamental recipe. I’m glad to see some people had luck with it, but I’m totally frustrated and giving up on it. I’ll stick with the maple pecan from now on. Agree with many this was such a frustrating recipe. I had to throw out my first batch as the sugar seized completely upon addition of the chocolate. I was moving quickly and had followed the recipe to a T. It was impossible to try and cook down as others had mentioned (to try and salvage it). When I tried it a 2nd time, I made sure to not have the sugar go above 250 (used candy thermometer) and tried to add the chocolate a little bit more gradually. Again, it started to seize . I was devastated. Fortunately, it wasn’t as rock-solid as time #1, so I threw it in the food processor with the tofu mixture. It almost killed my blade but it was able to get to good texture. Fortunately, the final produce was really tasty. But I will never make this again. The risk is too big, and costly. To have the panic the night before Thanksgiving — no thanks. One of the best recipes i have ever done.Nice job!!! It’s really the good recipe. All my family like it very much. Thanks a lot. Add a little bourbon and you have the perfect vegan pie for Derby weekend! Which might give away I’m from Kentucky. Did it, and it was great. Wao this is the greatest recipe, i am loving it. I would like to add this in my recipes book. I love this recipe, my wife found this recipe from this site. Thanks for this yummy recipe keep sharing this type of recipe.